This video was brought to my attention by fellow members of my faith. We may not always see eye to eye with those of the Catholic faith but this video is something I feel strongly about passing along. To those who agree with this....please get out and vote this November. This video came to my attention this morning. As this young man walks away from the camera...It brought a tear to my eye. One final comment. Some have suggested that the McCain campaign paid for this ad. Nothing could be further from the truth. McCain would never use soldiers for political gain. He has honored them, but he will not use them. This was a personal ad by someone who felt strongly about this cause. 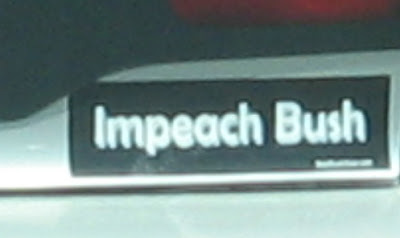 I snapped this picture while sitting at a stop light the other day. 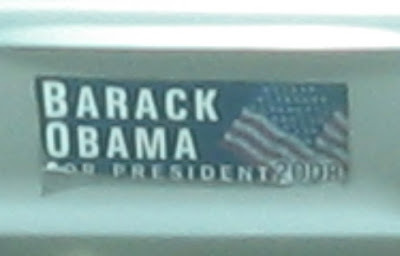 In the lower left was this bumper sticker, saying Barack Obama for President 2008. 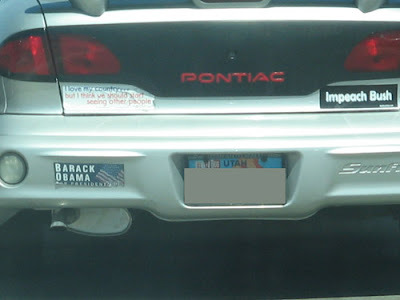 In the lower right was this bumper sticker saying Impeach Bush. In the upper left was this nail in the Left's coffin. 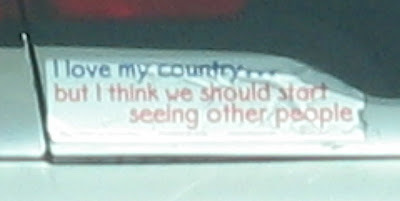 It says, "I love my country...but I think we should start seeing other people." The cat lover in me is incredibly happy right now. In all the time that I have been married we have not had a cat live with us. My hubby is some what allergic to them. 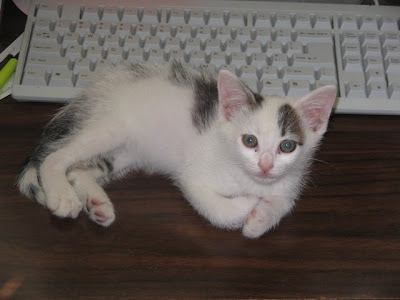 Then our neice along with the neighbor kids pitched in to buy a kitten for $5.00. Well, the neighbor kids' mom is highly allergic to the critters. So, we ended up giving it a trial run at our house. We still have to see what happens, but it is looking good so far. She is about 7 or 8 weeks old and is completely house trained. Good job kids...on picking a good cat! Our kitten's name is Bessie Cow. She looks sorta like a black and white cow...only MUCH smaller. Now we have a kitten who scurries across the floor and purrs up a storm. At this moment she is asleep on some stuff on my computer desk. Warning: If you don't play the game you might not care. If you do play the game...you still might not care. Read on if you want. 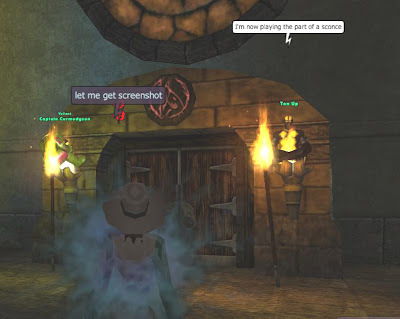 I recently convinced a friend to join in the fun on City of Heroes. I have been playing for over a year now and thought this friend would enjoy the game, as well. Well, he brought another friend along with and I have found them to be hilariously fun. Just this week I had to walk away from the computer to take care of family stuff. This picture shows what I came back to find. They had their characters jump up on the torch sconces near the entrance to a room. I quickly snapped a screenshot because it was so funny. 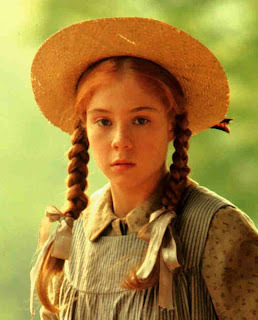 In the late 1987 I was introduced to a little red-haired orphan named Anne Shirley when PBS aired the new movie Anne of Green Gables. I liked the story, but something came up to prevent me from viewing the movie in its entirety. Some years later it was re-aired as a promotional tool to raise funds for PBS. This time I saw it from beginning to end. This time I was hooked on the story. I wished there was more. Not too long after this I learned that this movie was based on books written by LM Montgomery. In the early 90s I received the entire set of books about Anne. I read the whole set of 8 books in a little over a week. Like many good books that are turned into movies I found that there was a much better story told through the written pages than is portrayed on screen. A few years later I reread the series. This time I could not put the story to rest. There were parts of the story that I felt were left out. In order to get the "fill-in" stuff out of my head I wrote, what I later learned, was fan-fiction. I am now a huge fan of LM Montgomery. I have read other books she wrote beyond the Anne series. These include: Kilmeny of the Orchard, The Story Girl, The Golden Road, the Emily series, The Blue Castle, and various short story collections that have come to my attention. I have yet to read everything that she wrote, but give me time. I write about this now because the story of Anne Shirley was first published 100 years ago in 1908. The author, LM (Maud Montgomery) hailed from Cavendish, Prince Edward Island, Canada. After writing the first two books she intended to leave the story there. But fans of the books clamored for more. The subsequent 6 books in the series were written here and there with a couple of the stories written out of chronological order. People simply wanted to know what happened between times. "Cavendish is, to a large extent, Avonlea," Montgomery wrote in 1911. "Green Gables was drawn from David Macneill's house, though not so much the house itself as the situation and scenery, and the truth of my description of it is attested by the fact that everyone has recognized it." 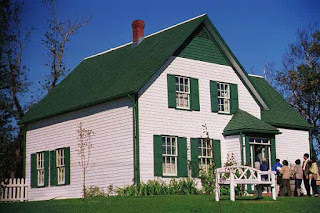 Montgomery's home is no longer standing, but the restored Macneill farmhouse, now known as Green Gables, has become part of a national park and draws thousands of visitors each year. Huzzah to Anne and to the lady who created her, Lucy Maud Montgomery! !